I’ve got a lot of new recipes this week – I discovered Health-Bent last week, and just happened to have lots of the needed ingredients for several of their recipes in the freezer. I’m struggling with some serious lack of wanting to cook anything at the moment, and new recipes usually get me excited again. And I’m kind of bummed I don’t have anything planned with citrus on the menu for this week’s Gluten Free Menu Swap, but I do keep a great big bowl on the kitchen table during this time of the season. My mother-in-law grows amazing mandarin oranges and I’m anxious for my grandfather to decide it’s been cold enough for his navel oranges to taste good. I’m also looking forward to experimenting with some citrus vinaigrettes for my salads. 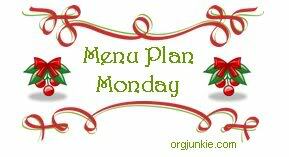 Shared at Org Junkie’s Menu Plan Monday and the Gluten Free Menu Swap at Glutenfree Goodness. This entry was posted in Simply Meal Planning and tagged gluten-free, gluten-free meals, Gluten-free menu plan, menu planning, paleo, Primal by Awkward Girl Gets Fit. Bookmark the permalink. Great menu for the week! Very jealous that you’ve got a home grown citrus connection! That should be amazing. I love roasted broccoli, thanks for the reminder. I haven’t thought of it lately. Oh, I forgot I had cauliflower in our frig. I’ll have to cook that up this week, too. Love the idea of roasting it. Thanks for including the directions.